South Dakota and the Upper Midwest continues to deal with the effects of snow, freezing rain, rain, and high winds. 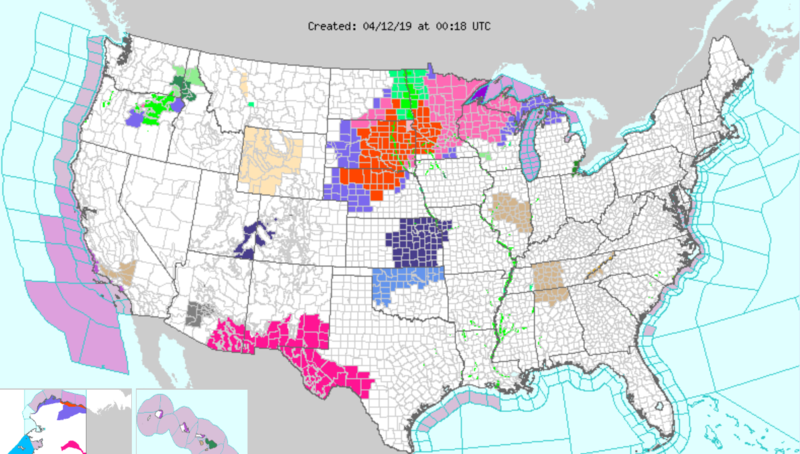 The National Weather Service has issued a blizzard warning for most of South Dakota for tonight and tomorrow morning - with areas near Sioux Falls and Yankton under Winter Storm Warnings for that same time frame. Portions of West River are under a Winter Weather Advisory until midnight local time. Earlier today, National Weather Service meteorologist Steve Fleegel in Aberdeen visited with SDPB's Jeremy Ludemann about the possibility of significant accumulations in northern South Dakota. West River was first to see the heavy snowfall and high winds from this area of low pressure. Here's Jeremy's conversation with Rapid City meteorologist Susan Sanders. The Sioux Falls area has dealt with a variety of precipation types this week. National Weather Service Warning Coordination Meterologist Peter Rogers discussed conditions in the city itself and places north, west, and south of town. The South Dakota Department of Transporation has closed Interstate 90 from Rapid City to Sioux Falls in both directions. Officials have closed Interstate 29 from Sioux Falls to Grand Forks, North Dakota. Many counties also have no travel advisories due to heavy snow and strong winds.